HISTORICAL DURAVEL – Does it hold a secret? Duravel is situated at the crossroads of four departments, Dordogne, Lot, Lot & Garonne and Tarn & Garonne, north of the Lot River approximately half way between Cahors and Villeneuve sur Lot and close to the medieval town of Puy l'Eveque. The town is built on the edge of a wooded escarpment and spreads into the flat valley area contained within a large 'U' formed by the River Lot. 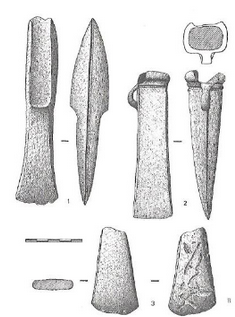 Evidence of occupation has been found going back to the Neolithic, Palaeolithic and Bronze Age. 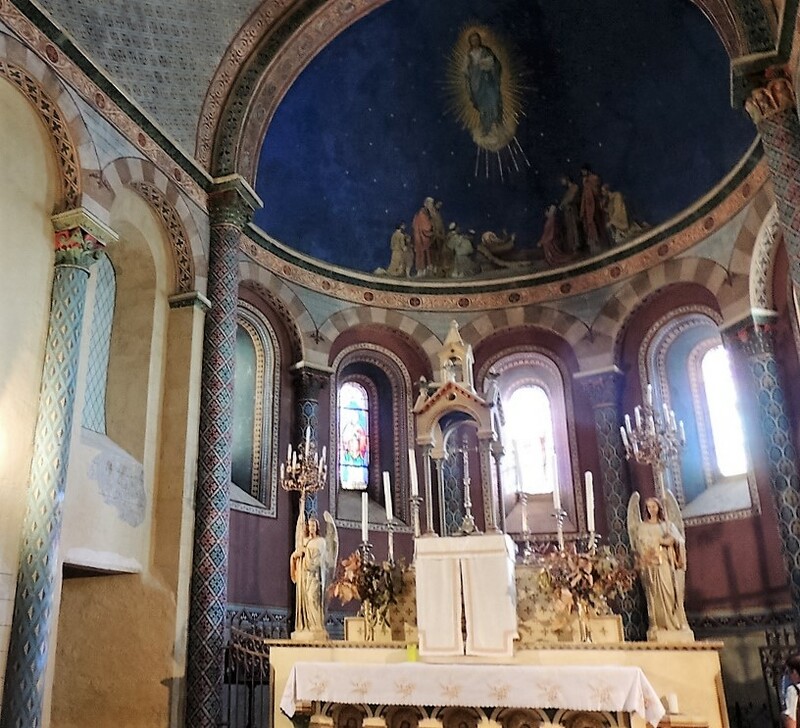 A few traces of Roman occupation have been found - a round building still in existence called the Roc de la Pile, Roman mosaics found in the same general area and a beautiful stone carved frieze placed inside the church. The church dates to the 11th Century and contains a crypt which is also thought to date back to the Roman period. 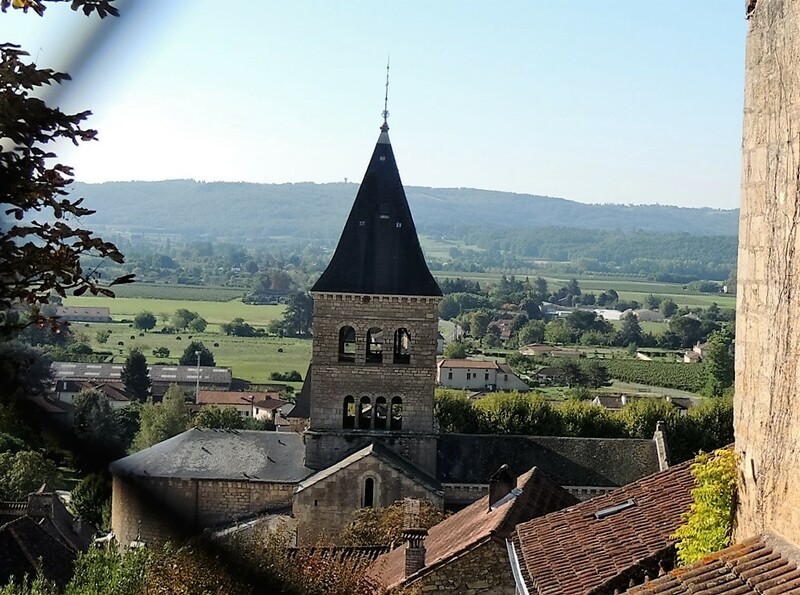 Le Comite pour l’Histoire et la Valorisation du Patrimoine de Duravel et des Vallees Olt-Theze works alongside the Mairie and their web site has been a rich source of information for this article. If you are interested in further details (in French) go to www.duravel-histoire.fr. 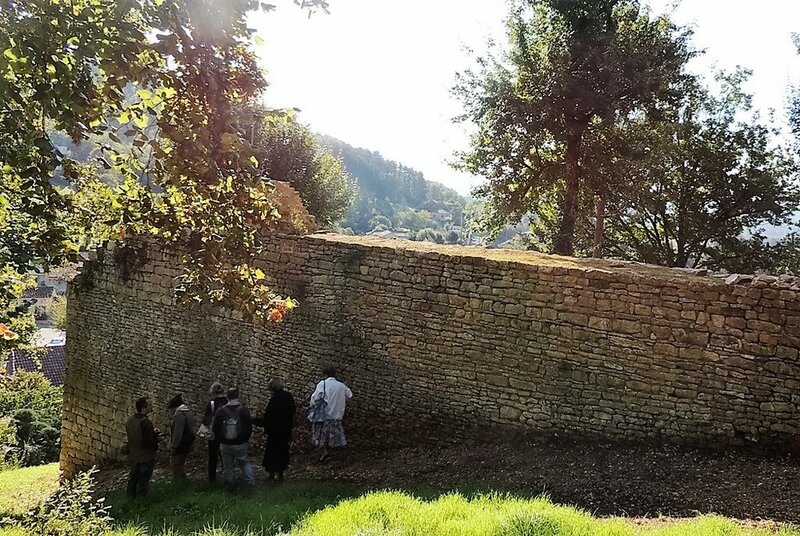 Their most recent project took five years working with volunteers to reconstruct and repair the medieval ramparts on the northern side of the town. Now the ramparts project is finished the CHVP is about to undertake a survey of ancient roads or 'voies' from the Roman period which may prove or disprove that Duravel is the site of Diolindum situated between Excissum (Eysses, Villeneuve sur Lot) and Bibona (Cahors) on the Peutinger map. Historians have mentioned that two Roman roads crossed in the proximity of Duravel, and which went east to west from Cahors to Villeneuve sur Lot and coming in from the south between the two regions of Midi-Pyrenees and the Aquitaine, crossing the River Lot at Vire and continuing north/eastwards towards Clermont Ferrand and Lyon. The CHVP group will be searching for evidence of both routes. The CHVP research group will be working alongside and using the same research techniques as the group AA47 based in the Lot & Garonne, who have been tracing the main and secondary ‘voies’ between Agen-Massels, Villeneuve sur Lot-Perigueux, Tournon d'Agenais - Couloussac (border between L&G, Lot and T&G), Touffailles-Tournon d'Agenais-Maux-Duravel, and Agen-Villeneuve sur Lot. To aide these areas of research both groups will work together sharing resourses, which will include flights to take photos from a light aircraft, and possible targets chosen for the use of a drone which has full authorisation. There will be an intensive study of all maps from the Napoleonic period up to the present including the internet mapping services of Google, Geoportail and Flashearth. Both groups are enthusiastic and hopeful that evidence of Roman buildings and roads could eventually lead to the discovery of Diolindum, which we all hope is Duravel, but are determined not to force the facts. Although there is an absence of any large Roman buildings in Duravel there is part of a round tower called Roc de la Pile. (PHOTO 5) It is believed that Duravel served as a military station during the 1st century – further evidence is needed and surveys are in progress. This artist’s picture (courtesy of the CHVP website) shows the original fortifications surrounding the town (called Durviel in tales by Froissart), which was fought over during the 100 years war. French troops from Cahors were sent to assist in defending the town during the siege of over five weeks in 1369, against invasions by the English who were led by Robert Knoles chief aide to Betrucat d'Albret, a Gascon Captain for the English King. Nicolas Savy, a specialist Middle Ages historian has brought to life this period during the 100 Year War in his publication ‘Betrucat d'Albret’. Behind the rampart walls of the medieval town stands the Chateau Boutier situated on the Route de l’Onde (already known by this name in the 11th Century). The origins of the Chateau date back to the 13th Century with additional surrounding properties and renovations during the 15th, 16th and 19th Centuries. There are other interesting medieval properties in the surrounding area. It is believed that the church (situated on a secondary Chemin de St Jacques de Compostella between Agen and Cahors), was originally contructed in wood with a stone crypt on a pagan site. 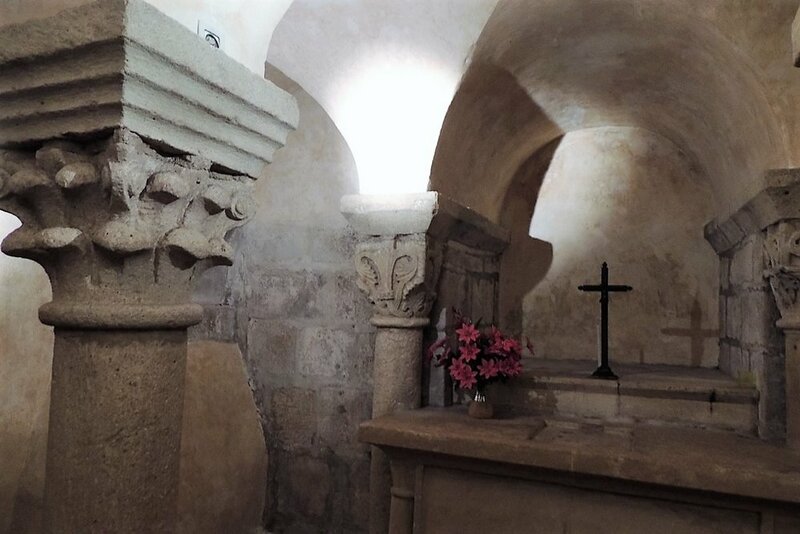 The crypt has stone pillars from the Carolingian period and is classed as a European Historic Monument. The original church was owned by the Seigneurs de Gourdon and was then handed over to the Abbey of Moissac in the 11th Century. The present church was started in the 11th and 12th centuries by the Benedictine monks. Placed behind the altar in a 12th Century sarcophage, and brought out during ceremonies were the three important relics of Hilarion (patron of the Romanesque church), Poémon and Agathon, previously housed in the crypt. Also set beside a doorway on the right hand side of the nave is the decorative Roman frieze. This spring, situated behind the Hotel de Ville, is supplied from two areas called Combe de Bacchus and Combe de Botié or Boutié, and arrives from underground with a massive Gothic arch dating to the 13th and 14th centuries. 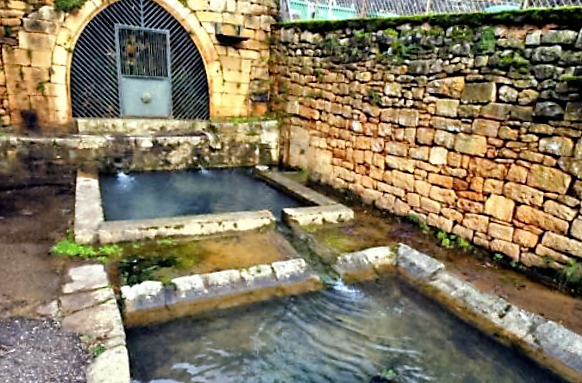 Two other springs can be found near Gary and La Barre. These three important water sources would have been enough to supply all the needs of a Roman town (Diolindum/Diolindunum) and during the medieval period a lavoir was added. Duravel is a town with an intriguing past and well worth a visit. Their restaurant, Cafe de la Mairie has a good reputation. It is therefore a good idea to book your table in advance. 05 65 35 29 43.